“Canadians love figure skating! 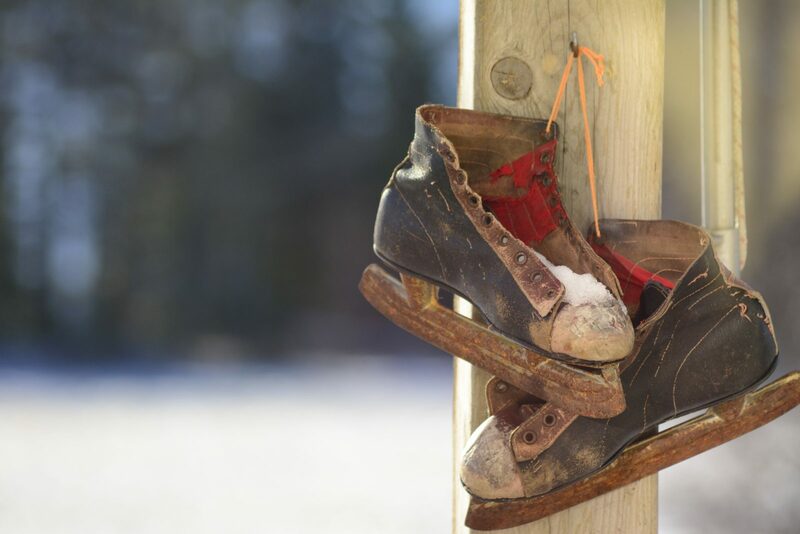 Every winter, millions of Canadians take to the ice, indoors and outdoors, in search of fun and fitness,” says Skate Canada, the governing body for the sport in Canada. Every winter in Canada, you’ll see many figure skating events on television – Skate Canada, Canadian championships, world championships, and more. Four years from now, Vancouver will host the Winter Olympics in 2010, and figure skating will be one of the highlights. So now is a good time to learn about figure skating. Before you know it, you’ll be hooked on one of the most beautiful sports in the world. Skaters in the men’s singles and women’s singles events perform steps, jumps, and spins in conjunction with their chosen music. In pairs skating, the man and woman perform steps, jumps, and spins, just like singles skaters, but they must perform them in perfect unison with each other. They also perform special pairs elements such as throw jumps, lifts, and death spirals. In Figure Skating, a Celebration, author and sportswriter Beverley Smith says, “Pairs skating is not for the faint of heart . it is the most dangerous of figure-skating disciplines” – but also breathtakingly beautiful. Ice dancing looks similar to pairs, because it also requires a man and woman to skate together. However, ice dancers do not perform jumps, throws, and lifts. Instead, they focus on graceful but difficult movements and footwork in time with the music. Throughout the history of competitive figure skating, two nations have won the majority of Olympic and world championship medals – Russia (formerly the USSR) and the United States. However, considering Canada’s climate and proud history of figure skating champions, far out of proportion to our relatively small population, Canada has a particularly strong love for the sport. Just as Canada is multicultural in many aspects of everyday life, the Canadian figure skating world is multicultural as well. Many of our champions are immigrants or first-generation Canadians. “Immigrants and first-generation Canadians have greatly added to Canada’s success at the international level,” says Smith. Elvis Stojko is the son of immigrants from Slovenia and Hungary. Named for the American singer Elvis Presley, the Canadian Elvis won three gold medals at the world championships and two silver medals at the Olympics in the 1990s. He also holds records as the first man to perform two extremely difficult types of jump combinations. Petra Burka, born in Amsterdam, Netherlands, came to Canada as a child. She won a bronze medal in the ladies’ event at the 1964 Olympics, and was the world champion in 1995. Four decades later, Burka continues to serve Canada as a mentor for young figure skaters at international competitions. The family of the brother-and-sister pairs team Otto and Maria Jelinek fled to Canada from Czechoslovakia in 1948. They won a gold medal at the 1962 World Figure Skating Championships, held in their birthplace of Prague. In those tense years of the Cold War, it was very risky for them to return to Czechoslovakia, but they courageously did so regardless, for the love of their sport. After retiring from competition, Otto continued to represent his adopted country when he entered Canadian politics and served as Minister of State for Fitness and Amateur Sport in the 1980s. Ice dancer Victor Kraatz was born in West Berlin, and lived in Switzerland before immigrating to Canada with his mother. Victor and his Canadian-born partner, Shae-Lynn Bourne, won the 2003 world championship in ice dance, the first Canadians to win gold in this discipline. Smith calls Kraatz “a valuable addition to Canadian figure skating,” as he continues to make his contribution to the sport as a coach. Although she does not represent Canada in international competition, Tugba Karademir has an inspiring story – with a Canadian twist. A native of Ankara, Tugba learned to skate as a child in Turkey, a country with only one ice rink and no coaches. She demonstrated early talent, but her family knew she couldn’t progress in the sport if she stayed in Turkey. So, at great personal sacrifice, her parents moved to Barrie, Ontario, so that their daughter could train with Canadian coaches in the top-notch facilities at the Mariposa School of Skating. Her Olympic dream came true in 2006 when Tugba became the first figure skater from Turkey to compete in the Olympic Winter Games, and was the bearer of Turkey’s flag during the opening ceremony. She placed 21st in the 2006 Olympics and 18th in the world championships, a huge achievement for a girl from a country that didn’t even have an ice rink before 1990, and a wonderful example of the influence of Canada on the world of figure skating.